The last surviving city of Earth is... Melbourne. This, at least, is the setting of Tobacco Stained Mountain Goat - a setting in which the Dome segregates rich ad poor, and where the Bill of Deviations outlaws many as 'Deviants': to be hunted down by Seeker Branch. Floyd Maquina, our markedly unusual protagonist, is one such Seeker. He's also remarkably knowledgeable about film, and it shows: in the course of the novel, Floyd must reference at least a dozen noir films. And probably many, many more. The noir influence on the novel is similarly visible: though Floyd's hardly a detective, his narration takes a similar line to the 'hard bitten gumshoe'. And in an SF setting, that's pretty original - and correspondingly, pretty fun. A stubborn attitude (overly so! ), witty dialogue, and some rather cutting insights combine to make Floyd the likeable protagonist that he is. Though occasionally it's overdone - Floyd is relentlessly stubborn, and frequently... Obstreperous. And occasionally you want to see some temptation. But minor qualm aside? He's good. So when Floyd's life starts to change, we're watching eagerly: after he first chooses to 'terminate' rather than apprehend a Deviant, things start to go wrong. His incarcerated, ill wife dies. His new partner has trouble. And though this might seem a dystopian slice of life, it's far more: and seemingly disconnected events tie together in a fantastic ending. I had my doubts (who doesn't, with a debut? endings are hard), but Tobacco Stained Mountain Goat genuinely succeeds in both surprising and surpassing your expectations. And as a reviewer - we have secret plot-senses - that's rare. So, what of setting? I'm not usually a fan of dystopias, or of the irrevocably down-and-out character. In this case, however, they work well - though Floyd does go to excess on occasion, playing the stereotype sometimes is just part of his genre awareness. Similarly, the government isn't relentlessly and unbelievably controlling. It's no 1984 - which I think is easily overdone. Instead, the Powers That Be are controlling, manipulative, and frequently appear corrupt. But they're not infallible - or overly fallible. We get a nice, cynic-bait compromise instead. There is no central side character: Floyd becomes isolated, and the novel reflects this. Nevertheless, several strong secondary characters do appear: Laurel, Floyd's girlfriend, Dot, his sister, Hank - well, the list goes on. Their voices are distinct and memorable, which makes several losses or anticipated losses all the more tragic. Though don't worry, I won't tell you who. 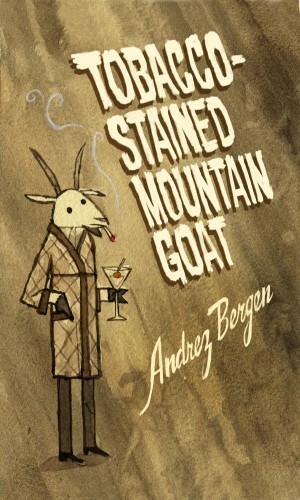 All considered, Tobacco Stained Mountain Goat is a small press novel well worth your time - and not just for that cover. Referential, inspired, and occasionlly defying any expectation whatsoever, this is an odd read that you really should try, despite its slow start. But then, this is SFF: slow starts are par for the course! Read this novel, or plan to? Comment and tell me below! Certainly was - and as for the cover, i rather like it. ;) Mind you, was in greyscale on the ebook, so not nearly so readable. Heh.